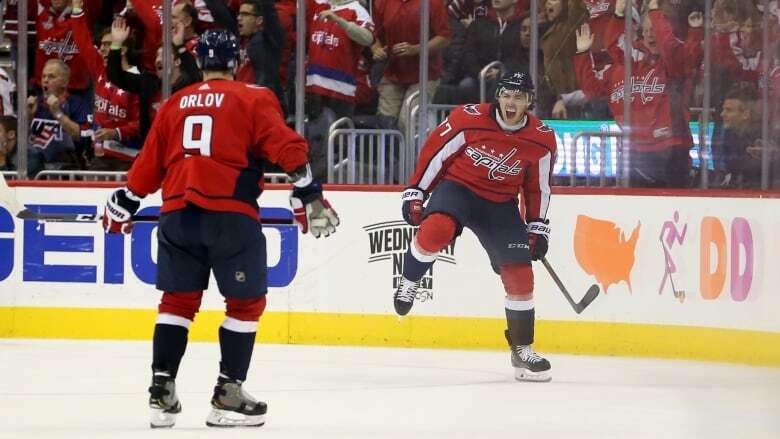 T.J. Oshie left for the second time after taking Evgeni Malkin's shoulder to the head but returned to score late and lift the Washington Capitals over the rival Pittsburgh Penguins 2-1 on Wednesday night in a meeting of the two most recent Stanley Cup champions. T.J. Oshie watched the clock in the training room hoping he'd get back on the ice. The Capitals forward needed two stitches to close a cut by his left eye and went through concussion protocol before returning to the game and becoming the hero by scoring with 1:14 left. Oshie doesn't care much what happens next to Malkin, who could get a hearing with the NHL department of safety. Oshie's focus is solely on Washington winning its second in a row. After Oshie took Olli Maatta's stick to the face in the opening minutes, Sidney Crosby and Alex Ovechkin traded power-play goals in a vintage showcase of their career-long rivalry. While he sat waiting to return to the game, Oshie heard about how goaltender Braden Holtby was standing on his head to keep the Capitals in the game. With Pittsburgh on the power play early in the third period, Malkin passed the puck and lifted his right shoulder into Oshie's head and kept skating. The officials conferred before deciding to give Malkin a five-minute major penalty. Pittsburgh coach Mike Sullivan said it didn't matter what he thought of Malkin's hit and added he's not concerned about the star Russian centre facing further discipline. Sullivan was more optimistic about his team's play than in previous games since returning from a successful trip to Western Canada. "I thought it was a solid effort by everybody in the locker room, everybody on the bench," Sullivan said. "I thought our guys played extremely hard. We deserved a better fate tonight." "I barely saw him on the bench there," center Nicklas Backstrom said. "He came back right in time. That's what big players do. They come back, they score the game winner."